Read our monthly round-up of the current epidemics and outbreaks of infectious diseases causing concern to business travellers across the world, written by Dr Adrian Hyzler, Chief Medical Officer at Healix International. 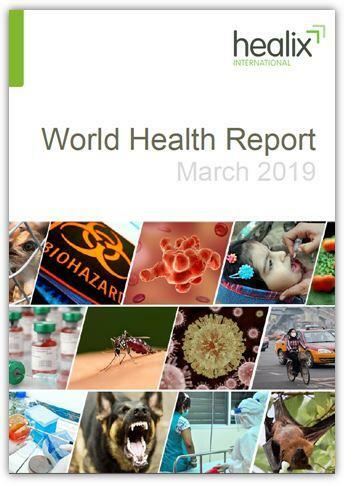 What’s inside the March World Health Report? VENEZUELA CRISIS – With the healthcare system in Venezuela in a state of collapse, could the region be in the grips of a potentially devastating epidemic of mosquito-borne diseases? SLEEPING SICKNESS – Proposed eradication of the African tsetse fly in a bid to eliminate sleeping sickness throws up a moral dilemma. Is it ethically appropriate to exterminate an entire taxonomic family? ZIKA – While Zika continues to be a potential risk in many countries in the Americas and around the world, what are the latest recommendations for women in pregnancy? When a serious infectious disease strikes, you need to act fast to isolate the risk and close down the means of it spreading throughout your organisation. Are you prepared? Healix can offer a free assessment of your current plans by a highly qualified specialist in pandemic planning. For more information, please contact us at enquiries@healix.com.